Happy Administrative Professionals’ Day…to me! 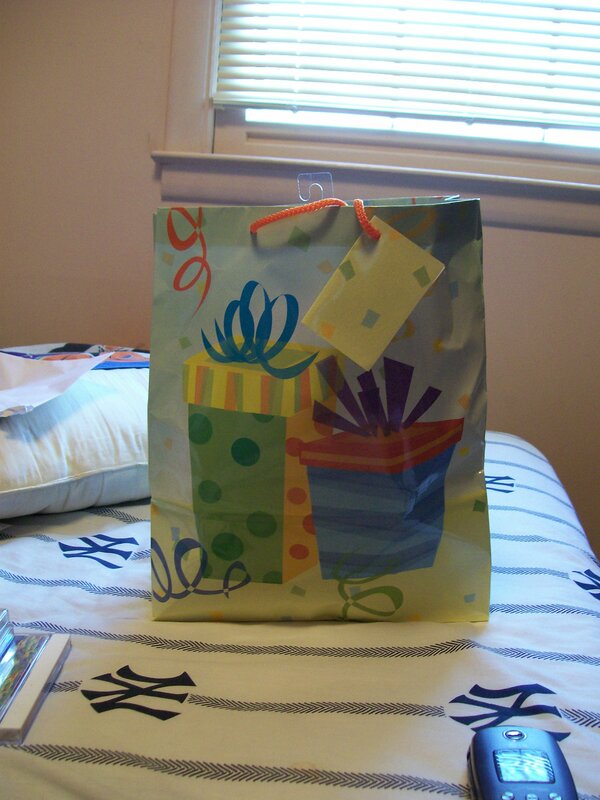 I went into work today to find a big frigging gift bag smack in the middle of my desk. Out of your system? Good. Because apparently those of us who bust our humps day-in and day-out to file your paperwork are special. How special? Special enough to get lots and lots of glorious stuff! There are some negatives to having your coworkers know about your crazy, obsessive-compulsive dieting. There’s those that express concern–either fake or sincere-but-misguided. There are people that will ask and comment about your diet incessantly. However, all of that goes away when people get you a big ol’ bag of food. 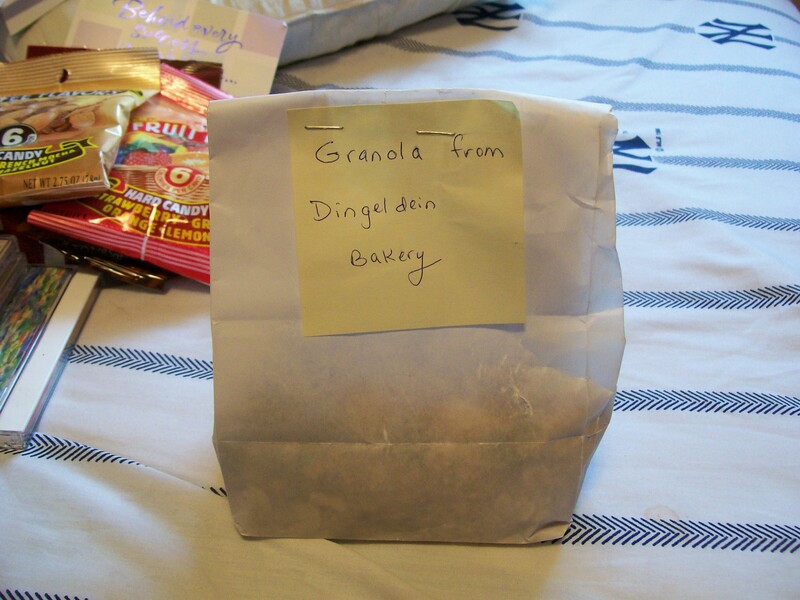 Granola from Dingeldein Bakery. There is no official webpage for the Dingeldein Bakery, but it’s probably the most costly bakery in the city of Harrisburg, PA. I was really, really looking forward to crunching on this stuff. I opened it immediately after work and ate a serving. I’ve never had plain granola before (only in super-saccharine bar form), but this stuff was incredible. Raisins and nuts and what I’d assume to be honey combine to form this delicious, dense conglomeration. Now I will stop describing something that everybody else already eats. Sugar-free candy! 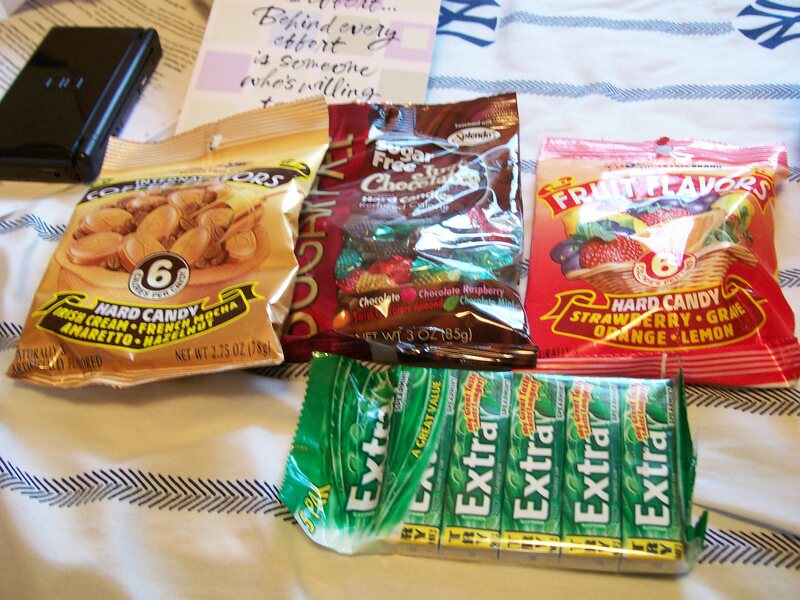 Included were packs of Extra Spearmint gum, Sweet ‘N Low Sugar Free Brand hard candies in both Fruit Flavors and International Coffee Flavors, and “Just Chocolate” hard candies. And, if that’s not all, there was a $25 gift card to my grocery store. That will come in handy, whether it’s just to stock up on fresh fruits and vegetables (cherry season is coming up, after all) or to gas up my car for the frequent hour-long commutes to my girlfriend’s house. I’ll certainly be remembering this come Bosses’ Day! What happens to those people right gob in the middle of the totem pole? We celebrate the head-honchos on Bosses’ Day (October 16) and the bottom-feeders on Administrative Professionals’ Day. Do the sandwich-meat (whatever menial position they tend to hold) just get to live day-to-day, happy in the fact that they’re benefiting from the knowledge and hard work of their supervisors and secretaries?